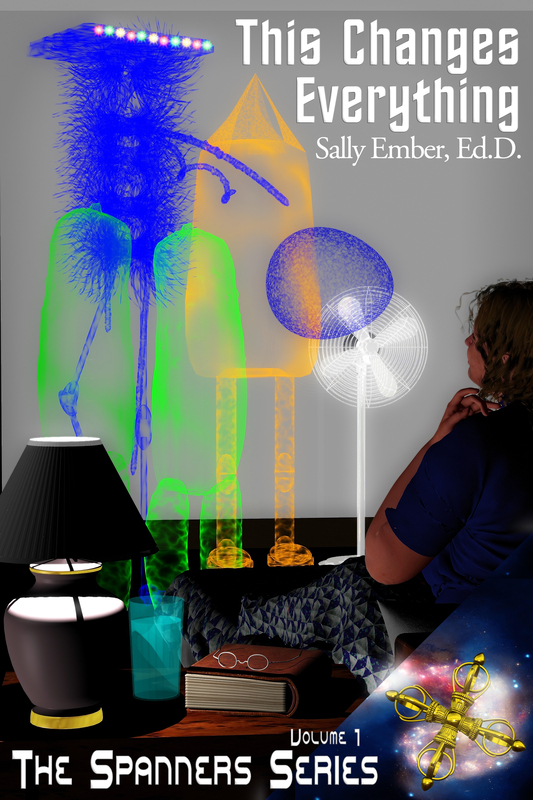 3 Reasons That This Changes Everything, Volume I of The Spanners Series, is Permafree | Sally Ember, Ed.D. Before I put my first sci-fi/romance/multiverse/paranormal/speculative fiction ebook, This Changes Everything, Volume I of The Spanners Series, up for sale, I attended free webinars, read guidebooks and blog posts and did a lot of research to find out how other fiction ebooks authors managed this journey. I discovered many techniques, procedures and tips which I employed, including what price to use for sales, how to use a pre-order period, and when to offer a book for free (and why). I have blogged about some of these topics already, but I haven’t written, yet, about why I decided to make Volume I “permafree” last month. I just did it. Now for the explanation, which is then going to be further explained and augmented by the article I’m including a link to, below. As a new fiction author, I do not yet have a significantly sized “following” or “fan base.” So, I spent a lot of time finding out how one acquires readers and keeps them coming back for subsequent books, since I planned a 10-Volume series. I read others’ stories of their journeys, articles about successes and failures, and took extensive notes I still refer to, from the many webinars I attended. Well-timed permafree works. Pricing is variable year to year, but market research has shown that series authors have been doing well to make the FIRST volume free, forever (permafree) AFTER later volumes come out. This brings in new readers consistently. cover art for all covers by Aidana Willowraven. Permafree brings in the curious and good content keeps them coming back. If the first volume in a series is good enough evidenced by its having a sufficient number of UNPAID and UNFAKED reviews showing that the book is well-written and worth reading, more and more readers will come to download it. This creates the beginning of the author’s fanbase and followers. There will also be those readers who just download anything free, which is also great (but works best if they actually read the ebook after downloading it, like it, and decide to look for and purchase subsequent volumes. Diversified authors attract new fans constantly; permafree gives them as easy way “in” to a series. If the author continues to offer good content BETWEEN books (via a blog, postings on social media sites, email newsletters, author interviews on others’ sites and/or Blog Talk Radio and the like, podcasts, Google On Air Hangouts, and perhaps short stories or other genre fiction) and continues to come out with good writing for each subsequent volume, by Volume III or IV, that author will have a solid following, loyal fans and great sales, all still being “fed” by the permafree Volume I. So, The Spanners Series now has Volume I, This Changes Everything, in permafree status everywhere ebooks are sold because Volume II, This Changes My Family and My Life Forever, entered its pre-order period @$1.99 on April 1 and goes on sale June 9 at $3.99. Since Volume I went free, the number of potential readers (reckoned by the number of downloaded volumes) has gone up 4000%. I am not joking. I can’t see how well the pre-orders are going for Volume II, yet, or know what the sales figures will be. Reviews for it are due any day, now, and will keep coming in over the next several weeks, if all goes as planned. I plan to post Volume I on more freebie sites and keep doing interviews, blogging, “creating and posting good content” as I work on Volume III, This Is/Is Not The Way I Thought Things Would Change, which is due out late in the fall of 2014. I will check in periodically here to let you know how sales and downloads are going and what else happens. Until/unless I become a gazillllllionaire author who doesn’t need to “bring in new readers” (when does that happen? ), Volume I will remain free. All downloading and purchase links for The Spanners Series as well as links to bloggers’ reviews, interviews and my archived blog posts are at http://www.sallyember.com on the right side panel. If you want to learn more about Book Marketing, #authors, http://buildabusinesswithyourbook.com/access/aff/go/sallyember It starts this week/weekend! Silver passes are FREE. Gold passes cost money, but I’m on Silver and it’s great! Lots of blog posts, interviews, videos, and more to help us do better with marketing wherever we are in our process. Check it out! Here’a a list of what’s offered just via the blog, just week one! Want to know more about making books permafree and see if these principles apply to YOUR books? Check out this article, linked to below. This entry was posted in Blogging and others' content, Indie or Self-Publishing, Marketing, Statistics, The Spanners, This Changes Everything, This Changes My Family and My Life Forever, Volume I of The Spanners, Volume II of The Spanners, Volume III, Writing and tagged blogging, ebook, free, indie authors, marketing, permafree, The Spanners Series, This Changes Everything, This Changes My Family and My Life Forever, WillowRaven. Bookmark the permalink.